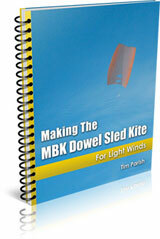 The winds were very light outside, giving the big Dowel Sled kite a chance for a good high flight. Sunset was not far off. This kite isn't the best for inland flying, since it doesn't take much of a bump or ripple in the air to collapse it! We headed off for a reserve near a local Primary School. Soon after we arrived, the Sled was in the air on a few meters of line. The air certainly was light, and the gentle gusts coming through were just enough to fill the sail and start it climbing. As the shadows crept across the grass, we backed further and further towards the far side of the reserve, coaxing the orange sail up and up, and occasionally recovering from a collapse. A couple of times it went all the way to the ground. The kite never went to its maximum flying angle, due purely to the lightness of the wind. A lot of the time it hung up there at around 40 degrees or so. Far short of its usual 65 - 70 degrees! There it is in the video, with the setting sun illuminating the Sled from the left. As the minutes ticked by, the wind dropped to almost zero at ground level, and the orange Sled was right at the bottom of its wind range. At times filling, then narrowing, in response to slight changes in air pressure. An aerial manta ray! At least I managed to let out 50 meters or so of line, which is probably as high as the Dowel Sled kite has ever gone. One day we'll have to take it down to the beach and put it up to 400 feet - as long as the sea breeze isn't too fresh! 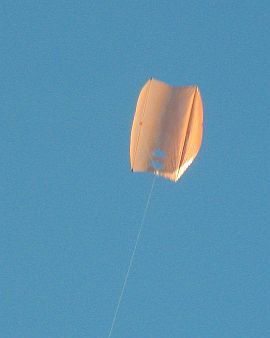 Eventually, flying the kite became a towing exercise, and there was no way even this very-light-wind kite would fly. The sun dropped almost to the horizon, and the air 'glassed off' as they say in some flying circles. Even at over 100 feet there was almost nothing. Leaving the winder on the grass, I pulled in line slowly, just enough to keep the sail inflated, until finally the Dowel Sled kite came down near my feet. Not bad flying really, but it left me wanting more!